If aviation sports attract you and you want to experience the best of them, try paragliding in Costa Rica. As you soar over the spectacularly beautiful landscapes of the country, you get to experience the most bio-diverse places having incredible flora and fauna. 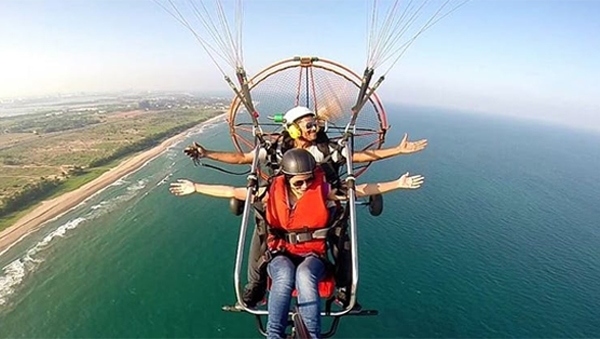 To make it even more eventful, Jaco Royale offers you the best paragliding packages inclusive of all essential services to make for an adventure of a lifetime. Paragliding gives you an opportunity to fly like a bird and watch the beautiful mountains, lush tropical forest, and coastline from an entirely fresh perspective. The breathtaking views of fertile valleys and lush jungles keep you excited and yearning for more throughout the tour. Jaco Royale also takes complete care of your safety and provide you with a professional and certified flight instructor who will give you easy lessons to enjoy this amazing sport. Paragliding is an adventure activity for all those who wish to explore the stunning beauty of Jaco in Costa Rica from an aerial view. This majestic town is home to the stunning gray-sand beach, spectacular rainforest, lush national parks with great wildlife. Soar like a bird above them all and experience their beauty to feel relaxed and rejuvenated. Our professional pilot provides you with a short training session on paragliding and gets you ready to take you off into the skies for a bird’s eye view. Jaco Royale invites you to soar high with the native birds flying next to you when you paraglide in the Dominical and enjoy hawk adventures. We launch you into the sky as you go on to gracefully fly with the birds, enjoy the beautiful view of diving into the clouds, watch landscapes and then ultimately land on a stunning beach.